The school was closed by 1965 when Pat & Kester came to the village. A Mrs Cooper owned the village shop (sited at The Post House) for 20 years. Some Americans owned the shop for 6 months before it was closed. The Langton Arms did try to run a village shop and post office for a while but poor custom made it not worthwhile. 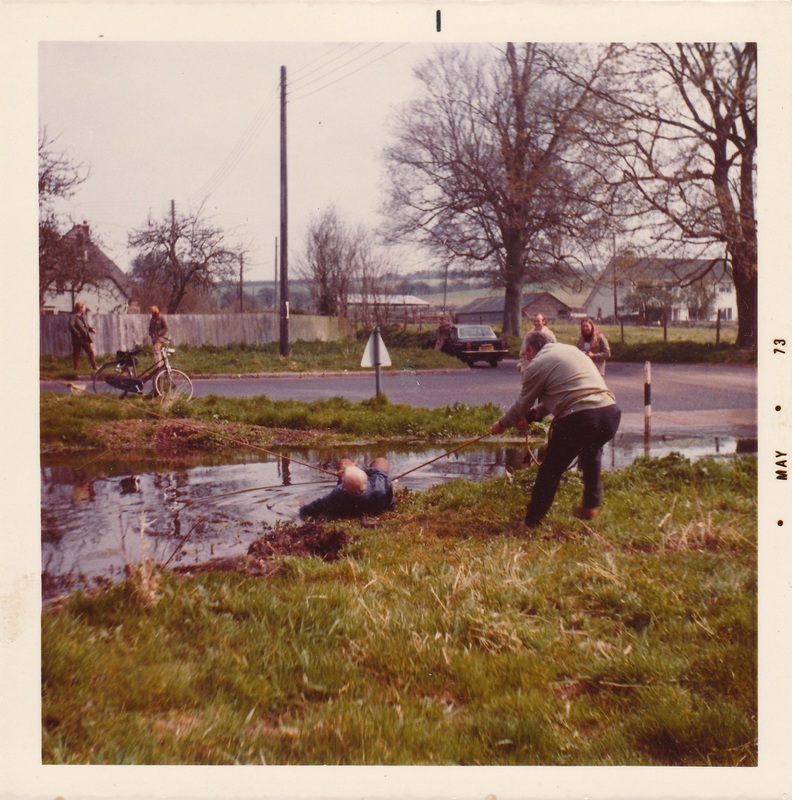 In 1972, the village suffered an electricity black-out due to damage done to the transformer in the field near AppleTree Cottage. In 1979, there was a fire where Brigadier Hanmer lived at Tarrant Monkton Cottage. Briar Cottage used to be a stable. There was a severe snowstorm in 1978. Boys walked on top of the hedge alongside the road opposite The Nook – the snow was some 10-12 ft deep. 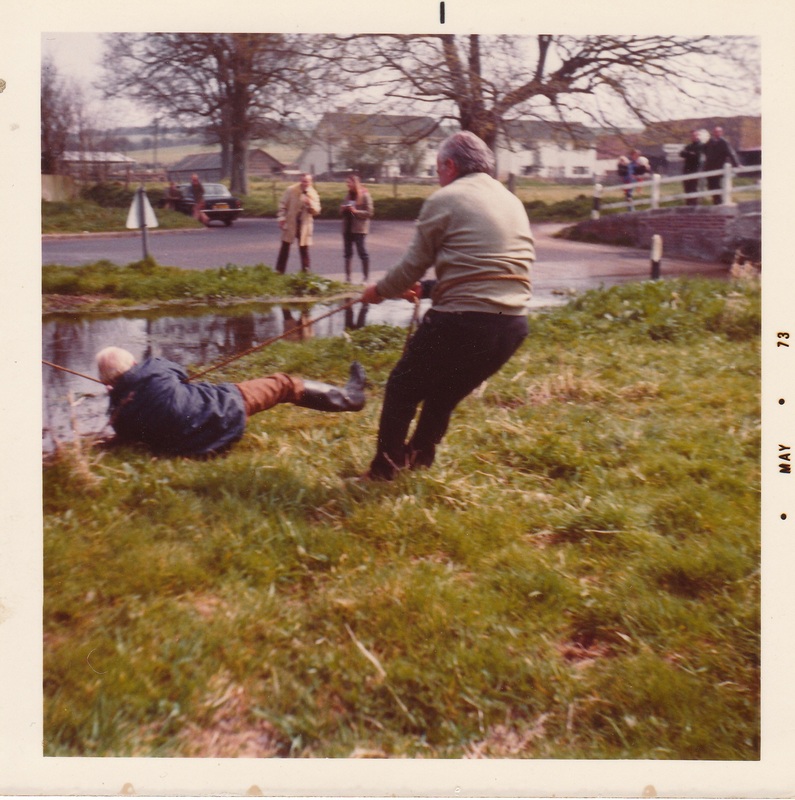 and his father (lying down) and friend, John Bugg, in the tug-of-war contest in May 1973 across the Splash. Like the lady Margaret mentioned back in April 2012, I too have many happy memories of Tarrant Monkton. Prior to her passing in June of last year my mum Alice (Jacks eldest sister) was probably the eldest living, remaining ex resident of the village, when she passed away she was 96 yrs old having arriving in Tarrant Monkton aged 2 months ! and lived there till she and dad got a new council house at Pimperne in 1947. My grandparents, Joe and Bessie White owned “Jacks Cottage” which they bought back in the 1920′s. Grandma once told me that she had to “bully” grandad into borrowing the 800 pounds from Ernie Hull (publican) to buy it. He thought he would never be able to repay it back and was it worth it etc ! I grew up in Jacks Cottage, knew every person in every house in the village, and there were some characters. I remember the Yanks at the Langton Arms waiting to get a glass for a beer, as there were none to be bought in those days. My mate Phillip Smeeth and I, were 9 yrs old by then,and knew of an old tip up the Camp Lane and used to dig up old jam jars clean them up and sell them outside the pub one penny for the pint ones and half penny for the half pint ones. I have often wondered what treasures are sitting in that dump.They used to take them back up the lane at closing time and being a bit drunk either loose them or throw them away…………we knew this , so would go searching the next day after school, wash them and sell them again. That’s only one of my memories. If anybody has heard the tale of the incendiary bomb in the pub, well I was the boy who carried it in, but there is another story in that ! I now live in Thailand and will be making my last trip back to the old country in Aug/Sept for my farewell and 78th birthday. One of the first places I will be making a ‘bee line’ for will be Tarrant Monkton. So if anybody wants to ask any questions just email me. I think I can still remember who lived in which house. Miss Ansty and Miss Sadler in the post office for example. As you say, the Crumplers were before my time, but I do remember mum talking of a Crumpler who lived in the big house set back from the road between Bessie Halls modern cottage and Mrs Van Drutens house which was close to Maidments bakery, but I think there was a man who was elderly and had a minder, although his name was John or something like that. I think my sister Stella, she’s a year younger than me. knows something about that. Incidentally, Mr Maidment the baker used to deliver his bread in an old horse drawn van but got smashed up one day in Tarrant Launceston just down from Strange’s farm almost opposite the cottage where the Bonds lived, when a Yank with a truck ran into him, the van was wrecked and I think the horse was killed, but am not sure about that. However that was the end of the bread deliveries although I remember going to the scene and picking up some nice loaves of fresh bread ! I thought it would be interesting to trace the lives of the youngsters, smiling at us from the Tarrant Monkton village school photograph, all those years ago. I am happy to report that the vast majority got married, had children and lived well past 70 years, with at least 11 living into their 80s and 8 living into their 90s!! They too would be well into their 90s now. Who knows, perhaps the school photograph is going to give us one Dorset centenarian! If anyone knows the current situation of the above two gentlemen, it would be great to hear about them. Again I should love to hear from anyone who can throw any light on them and let us hope that some or all are still alive also.. 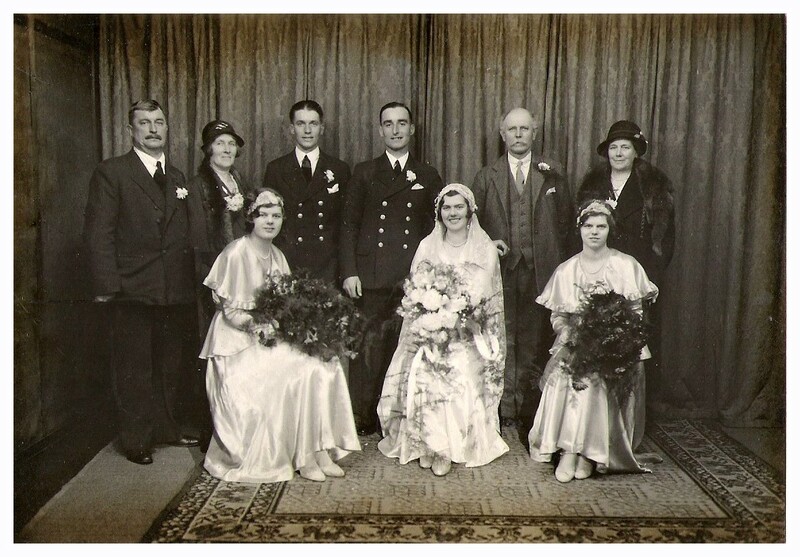 I would add that my own mother, Vera Crumpler, married Henry Matthews, a seaman from Poole, in November 1932. She had three children, myself (Garth), Shirley and Pam. I attach a copy of her wedding photograph, which I hope you like. She lived till she was 92. The other Crumpler girls in the photograph (and therefore my aunties ) lived long and happy lives also. Margery Crumpler married John Evans, lived in Lytchett, had three children and lived till she was 93. Winifred (Win) Crumpler married Harry Taylor, lived in Corfe Mullen, had two children and lived till she was 84. Mabel Crumpler married George Ashdown, lived in Oakdale, had three children and lived till she was 76. 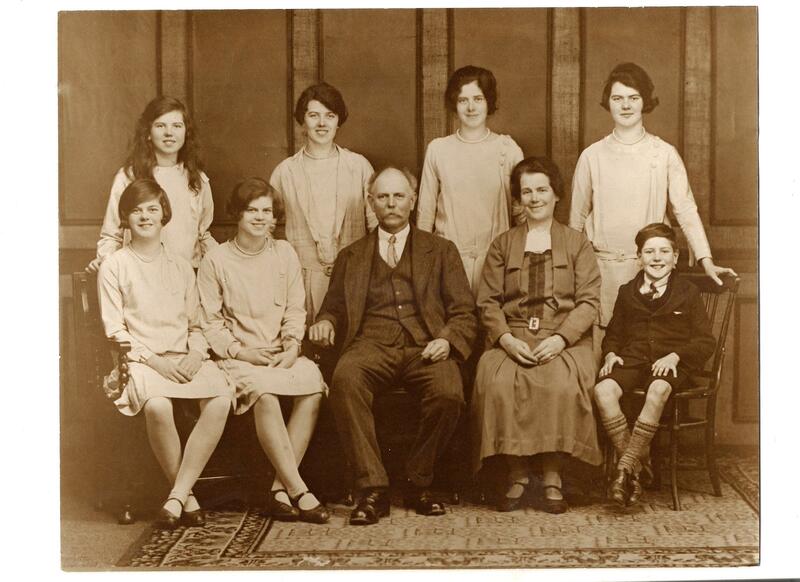 The Crumpler family (Ellis and Barbara and their 7 children) lived in Tarrant Monkton in the 1920s and I also attach the family portrait photograph, taken in about 1931, with all the family dressed in Sunday best. 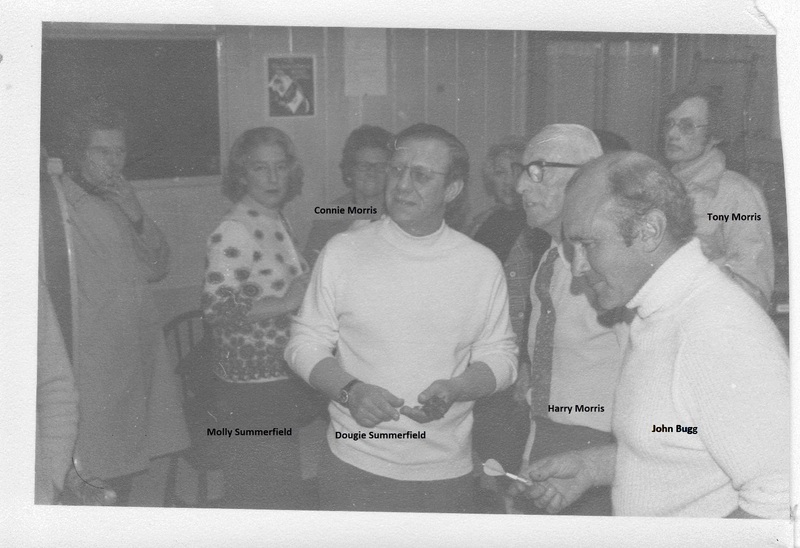 Stella Hayward, daughter of Alice White, provided the following photo-card, which shows a birthday party for Jim (Victor) Gatehouse and his friends including the Crumpler girls and Jack & Alice White. Stella says her mum believed the village War Memorial was built in 1920. I went to put some posters in the church this afternoon and met a woman who lived here 42 years ago: her parents were married here, her father is buried and she was christened here. Mum is in a home in Wimborne. Her father was a farm labourer at East Farm for the Mainwaring Burtons. She went to New York in 1976 and has stayed. They lived at ‘Bickerley’, where Andrew and Catherine now live. Her parents name is Read. Some will remember them. Ah! what secret mischief Philip Smeeth , my best friend, and i used to get up to. I remember late one summers evening, we decided to get into old Billy Poore’s chicken house and nick a couple of eggs. Billy’s small holding was down at the bottom end of the village. Anyhow, we managed to get under the fence and into the chicken shed. However when we tried to get out, his bull wandered along and decided to lay down right outside the entrance. We knew it had a rather bad temper as we often teased it through the fence. We were trapped! so all we could do was to sit quiet and wait for it to move on. But he was’nt going to oblige . We sat and quietly waited and waited, but no luck. As the night grew on and we were still missing, we could hear the whole village searching, thinking something terrible had happened. We could hear them talking, but dare not call out or we would be in worse trouble Just then we heard Mrs Smeeth calling out “Philly where are you” ( she always called him Philly) then we heard old Shep Smeeth, his father saying ” i’ll give him bloody Philly when i find him” Then Philip started to cry and called out for his mum. They had found us around 2 am. And the village once more went to sleep except for our two houses. Wow! This has made my day! My Dad Phil Smeeth sadly died in September 2016. I have heard the story of the Bull many times! I have also heard about David Langdown Dads mate. It really brings tears to my eyes reading these stories, but i love it! Dad would have been amazed at his childhood antics being recorded. Dad used to say that granny always blamed David Langdown for the things that Dad got up to!! It could not have anything to do with her Philly. But Dad said little did she know Dad was usually the instigator!! There was another story I heard from Dad about pouring oil on the farmers corn! Not sure if David was involved with that one!! (I expect so in my granny’s thoughts at the time!) I am sure there were a lot more stories. It would be great to hear some more if anyone has any! One fine spring day, Philip and i came across an old tin bath, it was about 6ft long rather narrow and had a flat bottom. Wow ! a boat thought we, the river was starting to flood so we could use it for cross river trips ! However first we need to find out if it works. Luckily for us my sister Stella, who was always trying to follow was nearby, so we put her into the ‘boat’ and shoved it out, not thinking of getting it back. We could just see Stella’s head sticking up with her hands tightly grasping the two sides as the bath/boat swirled around in the current. We tried to grab it but with no luck so we decided to run down along the river bank to where there was a footbridge halfway down the village, but by then she had picked up speed and passed us going under the footbridge and eventually sticking in the mud just before the bridge at Bugs farm…………….Boy ! did we give her a telling off for going so fast and not getting out when we told her . So many wonderful memories of growing up in this beautiful village. My parents lived in The Homestead next to Bay Farm. John and Betty Mckellar 1964 -1973. Anthony Johnson was the Parish priest. 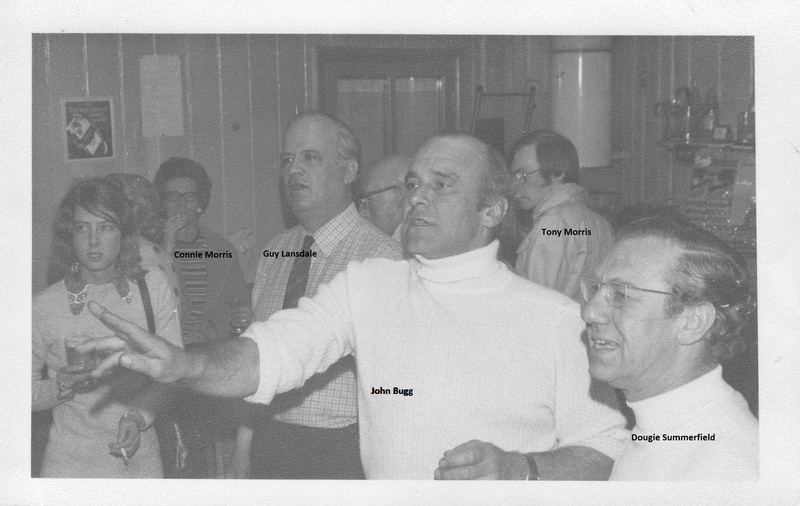 Names…Mr Pawsey, Eddie and Joyce Grant, Brigadier Hanmer, The Hulls, Adrienne and Bill Brannon, Patrick Bug. It was a great time for us a military family staying in one place for so long. But we are long gone now. I still love the Langton Arms though it is a lot more up market now. Love the Splash, beautiful village. Thanks for your message and good to hear some of the names who used to live in the village. If you have any good photos of the village in the 60s and 70s, please email them. It is always interesting to see how things were years ago. Many, many years ago, in 1969, a young man by the name of Henry Hanmer came to work in Honduras, Central America, in one of the Branches of the now defunct Bank of London and South America. He was the youngest son of Brigradier John Michael Hanmer. He used to speak rhapsodically about his home in Tarrant Monkton. I just realized that he died at the young age of 45 in 1989. How very sad. I just wanted to tell you that even in far-away Honduras, the name of Tarrant Monkton was known as a piece of paradise in England. Thank you for that memory. Some folk here still remember the Hanmers.